A modern Soft point that utilizes a unique mechanical type design philosophy called a cutting edge projectile. 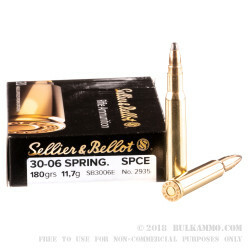 As the name implies it was “cutting edge” at its introduction but the cutting edge refers to the mechanical action that takes in the barrel and during the impact of the bullet. 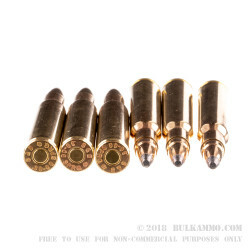 The stepped design allows for better rifling engagement and the partially hollow design allows for a more primitive approach to the same process that takes place with polymer tipped projectiles on the market contemporaneously. 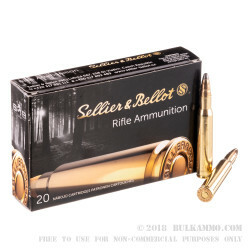 Sellier & Bellot is among the few companies still utilizing a CESP projectile in any load, and this is a classic example of a load that can benefit from the design well. 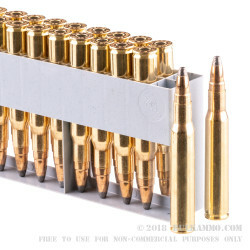 The general versatility of the .30-06 caliber and the hard hitting ability of such a large cartridge makes this an easily mated combination. The 180 grain bullet is an absolute behemoth for deer season, but still isn’t overkill on larger bucks. With a cutting edge bullet, the weight retention is enhanced and the deformation is relatively controlled with a nice wound channel profile supplied on impact. The substantial ballistics means this is suitable for higher weight large game as well. The velocity and energy is substantial at 2460 fps and 2788 ft. lbs. of energy.